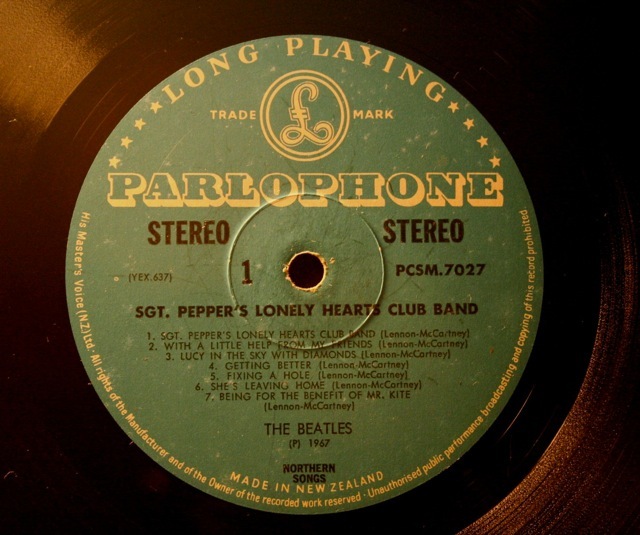 For some reason today I started to think about all the different label variations there must be of Beatles LP and single vinyl discs – released over time and from a wide range of countries around the world. Different countries have different labels of course, but there have been many label artwork changes over the years – from the original issues to the more recent re-releases. For some collectors this is a never-ending fascination. How many different label variations can they possibly find of a particular album or single? For me as a collector it’s not the primary reason I’ll purchase an item – but for certain titles I already have it can be a factor. For some reason if browsing a stack of second-hand Beatles LPs I’ll always go looking for different labels or covers for Sgt. Pepper, Abbey Road and Let It Be. Don’t know why – I guess they where formative in my initial collection and mean more to me as records than the other titles in the collection. As a result, over many years, I have accumulated a few variations which I’ll share with you over the coming few weeks. (To see larger images just click on each picture). This Apple has some unusual features – most prominent among them the large STEREO lettering on the right hand side. 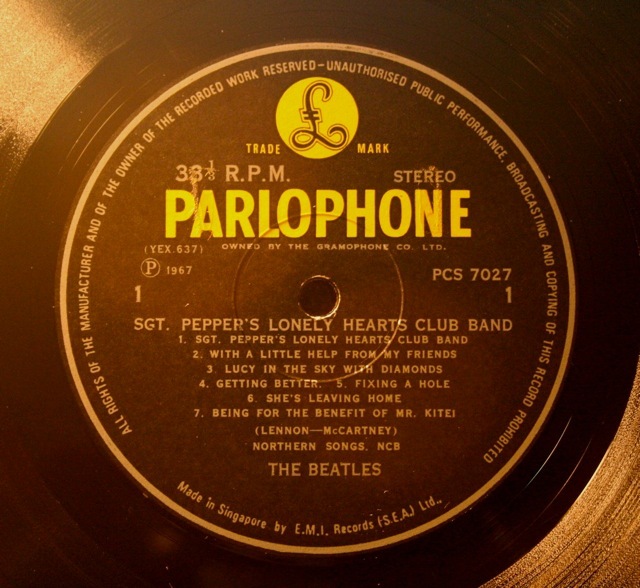 As you can see in the picture above, the Parlophone name and logo is in a large box, and the EMI label is also present twice on the label in smaller boxes. This is the label you will see if you go out tomorrow to buy a vinyl UK release of this classic Beatles record. This entry was posted in Beatles, Beatles Collecting, Beatles Music, Beatles Related, George Harrison, John Lennon, Paul McCartney, Ringo Starr and tagged Beatles, Beatles Collecting, Beatles Related, George Harrison, John Lennon, Music, Paul McCartney, Ringo Starr, Sgt. 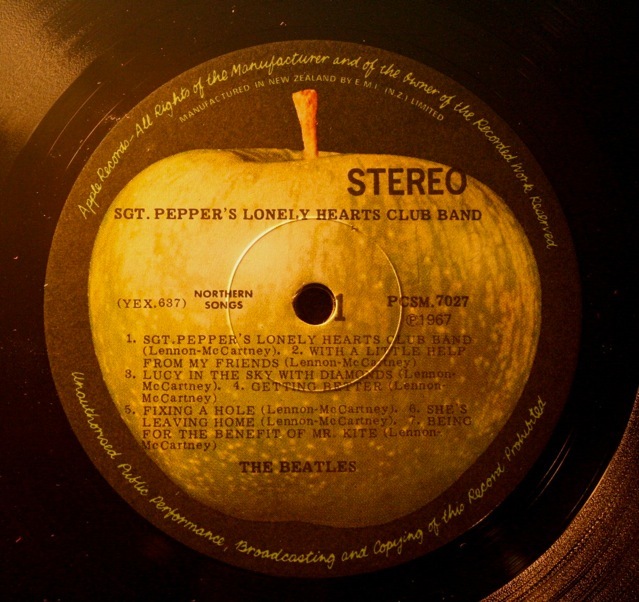 Pepper by beatlesblogger. Bookmark the permalink. Anyway you are forgettng an issue. 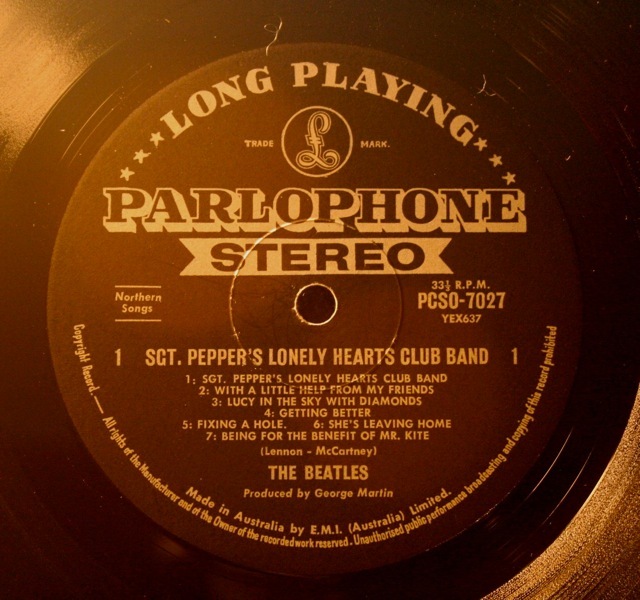 -1967 August, PMCO 7027 MONO (yellow parlophone) and PCSO 7027 STERIO (big silver parlophone) were released. Hi – St Peppers in Singapore was amended to exclude the track Lucy in the Sky but I have an early pressing on the EMI Singapore /Malaysia label that includes the full (UK) track listing. Just wondering if you were aware of this. Could send you pix or track listings or any other details if that would interest you. Hi Ian – I’d be very interested to see some pics and track listings if you could send them – especially of the Singapore album without the Lucy in the Sky song, plus the early pressing you have with the song too. I have the single-sleeve red vinyl 1987 Australian pressing of Sgt Peppers. Inside the sleeve there are also cut-out Sgt Pepper figures (!) which is novel. I worked in a record shop when this was released so bought it and have never played it. It is in mint condition. Now I want it to go to a good home. Do you know the best place I could put this up for sale and are u able to give me an estimation of its cost please and how rare or unrare it is? I was thinking ebay but now I am thinking maybe there is a dedicated Beatles site for true fans. 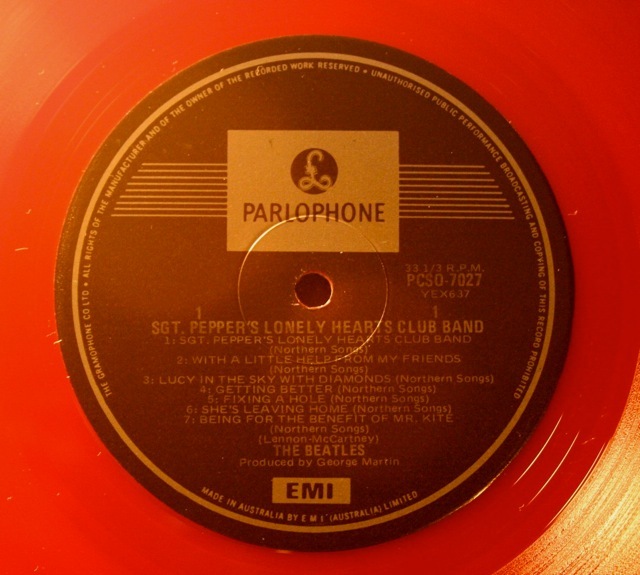 The red vinyl is a collectors item issued in 1987 to mark the 20th anniversary of Sgt Pepper. (It was also re-issued that year on black vinyl as well). 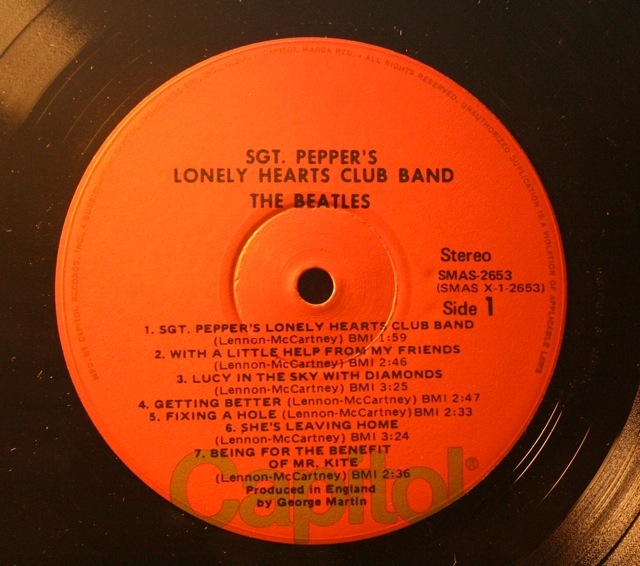 The red vinyl usually comes in the gatefold sleeve, and as you say it has the cut-out Sgt Pepper figures as an insert. If you purchased this new from a record store in 1987 then it means that some single sleeve copies must have also been released. You’d probably get the best price for it on Ebay. The gatefold sleeve probably attracts higher prices. In mint condition I’d say you’d get $60-$70 for it, maybe more. There was a sticker on the front saying “Special Limited Edition in Coloured Vinyl”. That would add a little bit too. Explain the record store story above in the listing so buyers know its all original. Thank you so very much for your very kind reply. I am very grateful. I didn’t receive any notification that you had replied so I am sorry it has taken me so long to get back to you. I have done a little research on this and discovered it was withdrawn from sale and then re-issued in the gatefold sleeve with only 9000 being pressed (not sure how many sold). I was working in a music store when it was released and I remember they also released Yellow Sub on yellow vinyl and The White Album on white vinyl. I remember an internal battle happening since I couldn’t afford all three, only one at the time. (It was fun working in music but it didn’t pay a whole lot!!). It appears I made the right choice. I have never played it and kept it in a big chest with my other records in plastic sleeve free from dust etc so it really is in pristine condition. Working in music for 21 years, I was very lucky and often had first pick at these little gems. Quite often, a lot of titles wouldn’t make it to the floor – for limited editions the record companies would quite often allocate your store the quantity depending on store size. You couldn’t just put your order in as is generally the case. Thank you once again for your reply. I really appreciate it. Andrey (who helps to maintain the fantastic Russian Beatles vinyl site http://www.beatlesvinyl.com.ua ), sent me two scans of Sgt. Pepper variations from Russia. They are both on the AnTrop label – one plain white, the other red. hi there,the bluw/white pressing above is the first pressing here in NZ.We didn’t release a mono version.The next release was on the yellow/black label(quite hard to find now) then 3 different Apple labels (HMV, EMI, Orange) then 1976 Parlophone label, and finally the 1982 Parlophone label – all up 7 label variations. Hi Ross, Thanks for the info on these NZ pressings. NZ opens up a whole interesting area for collecting. I have only a few – but always like to find them and add them into the mix. Has anyone come across capitol labels with beveled edges on Beatles records(vs. Flat) A dealer here in the US said that if it’s beveled along the label edge it’s a fake Please help 50% of my albums are like this. Thank-you! First I’ve heard of this one but someone out there will no doubt be able to assist with more information. Capitol had a number of different pressing plants around the country and so this may account for different ways the labels might be sealed onto the disc. If you could provide a bit more detail about what you mean by “beveled” edges that might be helpful. Cheers. 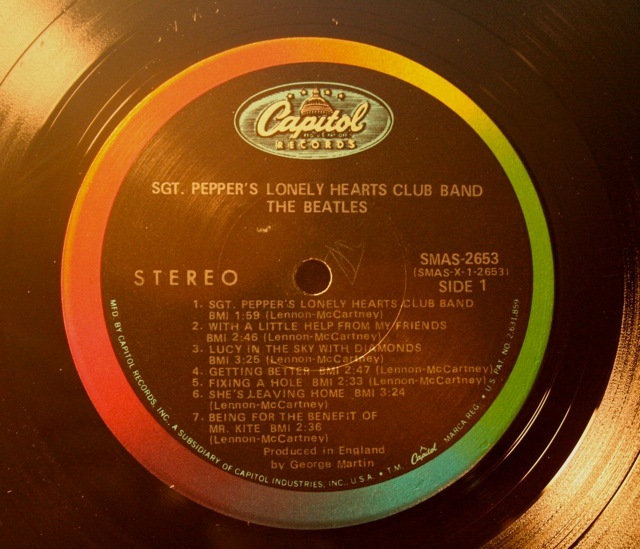 Capitol pressed singles with non-skid beveled edges starting in 1968. These are indeed genuine. 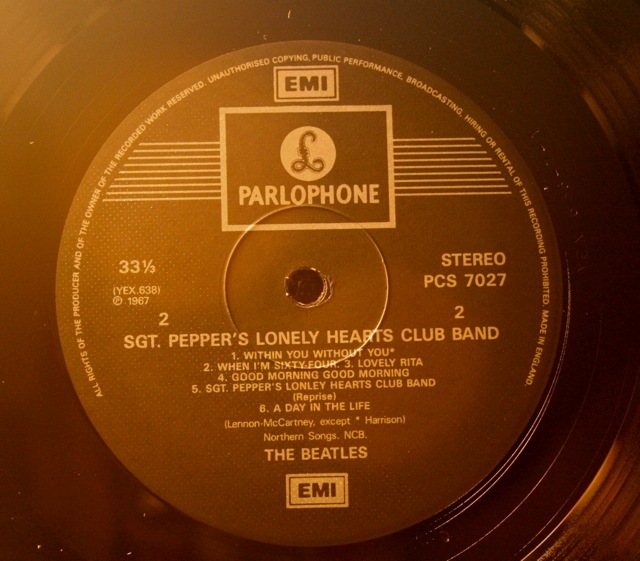 Hi, I have a Sgt Pepper lonely hearts club band LP on the Orfeu label which is portuguese. It contains 2 lps, but I cant find any info out. Any ideas on it please? The cover actually says Sgt. 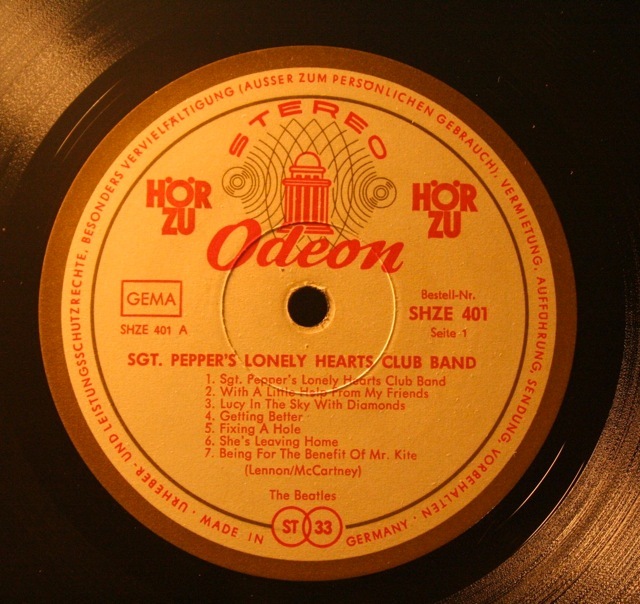 Peppe’s lonely hearts, but the labels say sgt. pepper’s. thanks. Sorry, forgot to say that the cover is totally different to any I’ve seen. It doesnt mention ‘Beatles’ anywhere, just the names of each beatle next to each song. the label is black with a photo of a band stand and the writing is in red. thanks again. If you have any pictures you could send through that would be good. It will help the collectors out there get you an answer! It’s a Beatles cover band. Maybe that’s why the name is wrong. As to Sgt. Peppers record. Mine is red vinyl marked 1967 EMI Australia & as described above it also has a gatefold sleeve marked “special limited edition coloured vinyl” with a cut-out insert page…..& as advised above worth maybe only $60 or thereabouts? YEs Paul, definitely a collectors item if it is in mint condition and should increase in value. Hello – firstly thanks for a great blog very interesting and informative. Wonder if you can help me with a little query I have a NZ version of Sergeant Peppers that I picked up today that has a different label again to the ones you have shown. 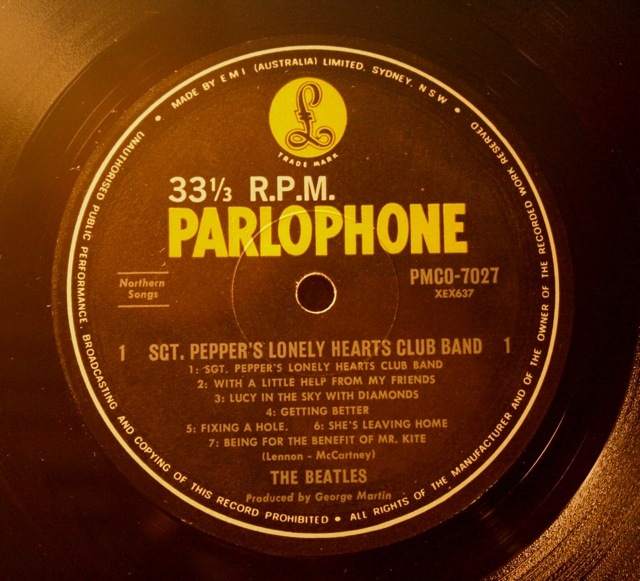 Its on PCSM 7027 (YEX 687/8) on a black/silver Parlophone however neither the EMI logo or the Parlophone logo have any silver infill – it also has no stereo stamp and it has northern songs above the album title. Is this one you have come across before? Have emailed some pics. Hi Mike, it sounds very interesting. Could you email those images so that we can have a look? You say you’ve sent some but none have arrived. Thanks. 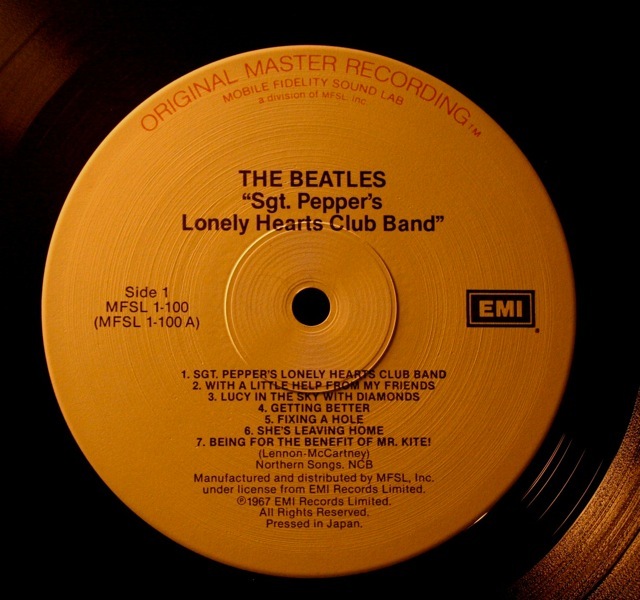 i HAVE A MINT SGT PEPPER EDITION WITHOUT WITH A LITTLE HELP……LUCY IN THE SKY…AND A DAY IN THE LIFE….BUT WITH THE FOOL ON THE HILL,BABY YOU’RE A RICH MAN,I’M THE WALRUS. FRONT COVER IS THE USUAL,BACK GATEFOLD COVER IS DIFFERENT WITHOUT LYRICS!!!! !HAS ANYONE COME ACROSS WITH THIS ITEM? Excellent page. I got a copy of the traditional Capitol label (rainbow as in the image you posted ). However, the inner album sleeve has red and white swirls. Also, a cut out was included. Did this get made in 67 or was it later?? Many thanks. Hay mate I’m iv got I believe to be a uk version on the beetles sgt pepper lonely hearts album -1987, PCSO 7027 black silver parlophone but in an original album cover any idea how much the market price is for it? Hey, good evening! I’m from Buenos Aires, Argentina, and I’ve just bought a version of this album pressed in red vinyl, from the UK. Do you happen to have any information? Is it a 1987 20-anniversary-edition as well? Thank you very much! 6. Black colorband revival (1980s). These labels have a warning against unauthorized duplication in fine print. The later albums, except “Let It Be,” had labels 3-6. 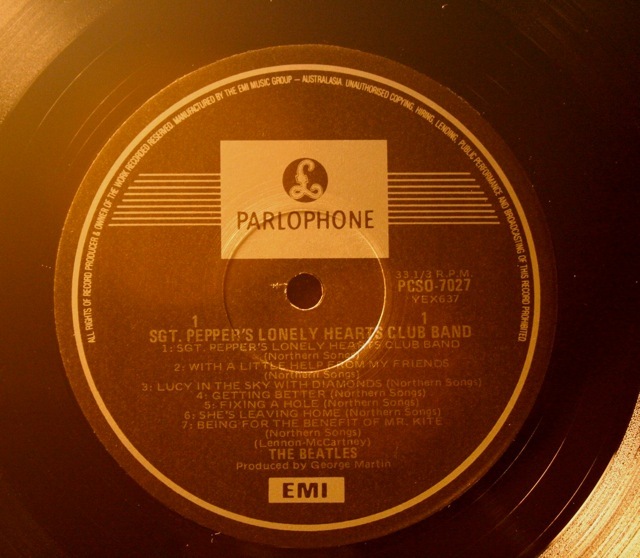 “LIB” originally came out on RED Apple labels distributed by ABKCO. Counterfeits are rampant with this label. I think the first Capitol pressings were label #5. Hey beatleblogger. Very interesting indeed. I have a wide spine stereo version gatefold on orange and black Parlophone (first image of yours) Australian but all the numbers such as side 1 yex637-1 and then side 2 yex638-1 point to it being a UK version. My album cover is wide spine stereo visible flaps and patent pending on rear cover. The fools sleeve is printed in Great Britain and the cutouts are the same. I’m figuring mine is an original Aussie first pressing but look at those different labels. ??? Hi, this site has all the info on labels and matrix numbers used for each of the Australian pressings. Check the labels, then scroll down for much more detail. Hope this helps! Hi, I have the UK Sgt. Pepper stereo album which I purchased new in 1968 or 69. When I got it home I realised the labels were on the wrong sides of the record. I was going to take the LP back to the shop but never got round to it. Do you know if there are many of these about or are they rare? As a matter of interest. I worked as a printers assistant at Garrod and Lofthouse in Crawley UK. in the 70’s. i was told the plant worked 24/7 for weeks printing the covers for the Sgt. Pepper LP. [Lots of overtime]! They had Roland 4 and 2 colour printers when I worked there. I guess they would have been there in the late sixties. Garrods had two printing plants in Crawley, A Web offset plant for magazine and catalog work and the Sheetfed plant for album covers. The Sheetfed plant was actually called Hubners Ltd. but was owned by Garrod and Lofthouse. Hi Roger, mis-pressings like the one you have are quite collectable and there seems to be a bit of a market for them out there. 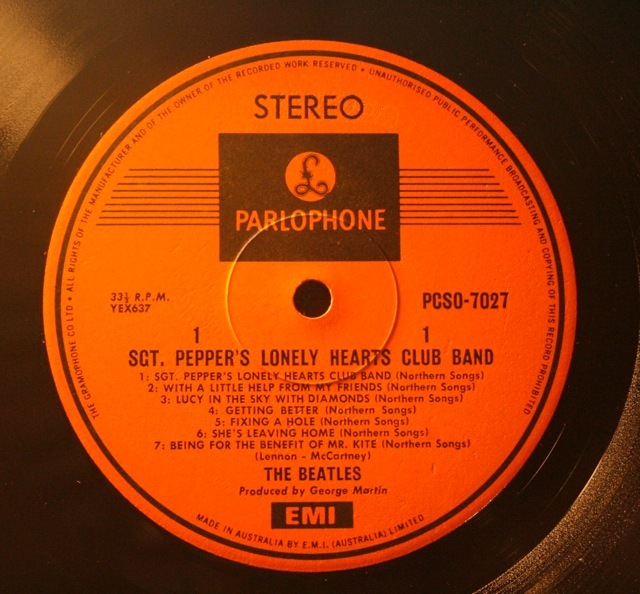 If it is an early pressing of Sgt Pepper and the cover and record is in very good condition, plus it has the printed “cut out” insert and the unique inner paper sleeve that it came with – then even without it having the wrong labels it would be quite a valuable item. It would also help to know if it is a mono or stereo pressing too. Thank you for the information about the printers Garrod and Lofthouse. It is a company that’s truly associated with the Beatles covers and sleeves and the details and personal reminiscences you shared are terrific.